It has such a satisfying click and it works so well. Plus, it's just about perfect for charging your Raspberry Pi - either Model B, A+, B+, or Pi 2. Just hook up the standard USB end to a 5V 1A USB port power supply or 5V 2A USB port power supply and the Micro B end to a Raspberry Pi and you have a Pi with a switch. This cable will also work with anything that has a MicroUSB port. 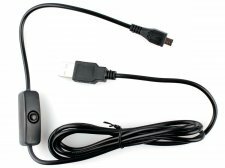 This cable does not transfer data - so it's mostly just good for powering and charging devices - but adding an on/off switch to your power supply is a nice addition and one that we absolutely love clicking.